HABIT: Very large, simple, heart-shaped, large leaf – 5-12” long. Typically quite velvety to the touch. Green above and paler below. Large, showy, upright clusters of purple flowers late spring to early summer. Very fragrant fruit 1 to 1 ½ inches long filled with (1,000s) of small seeds that are initially sticky and green, later turning brown and dry. CULTURE: Best in full sun. Grows well in wet, deep, well-drained soil. Drought tolerant. Aggressive ornamental tree that grows rapidly in disturbed natural areas, including forest, stream banks, and steep rocky slopes. 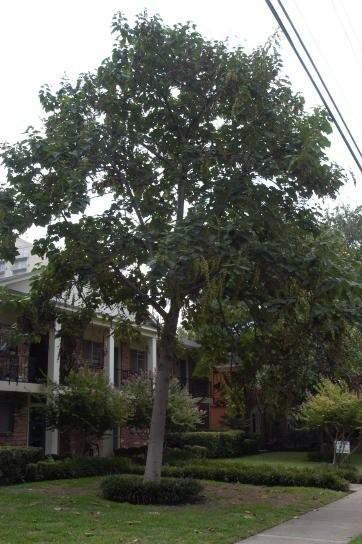 USES: Highly-prized lumber, shade tree, open spaces, specimen tree. PROBLEMS: Aggressive and considered weedy. Bark is easily damaged, mildew, leaf spot and twig canker. NOTES: Environmentalists are concerned about it escaping into the wild. FACTS: More recently, this tree has become a timber-crop plant and is being raised on plantations. This is one of the most valuable timber species in the United States despite the fact that the wood is not used in this country. It is the preferred wood for oriental lacquer ware. Population pressure prevents it from being grown in its former range. It is an excellent export crop for the United States. Ohio is the northern limit of its adaptability. 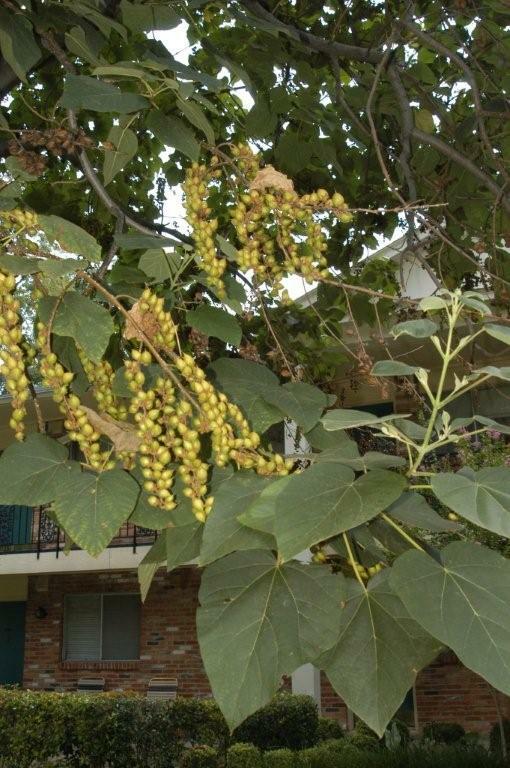 In Ohio, paulownia winterkills easily unless cold-hardy seed sources are used. Even then the plant can be damaged in an unusually cold winter as happened in the Smokey Mountains a decade ago. 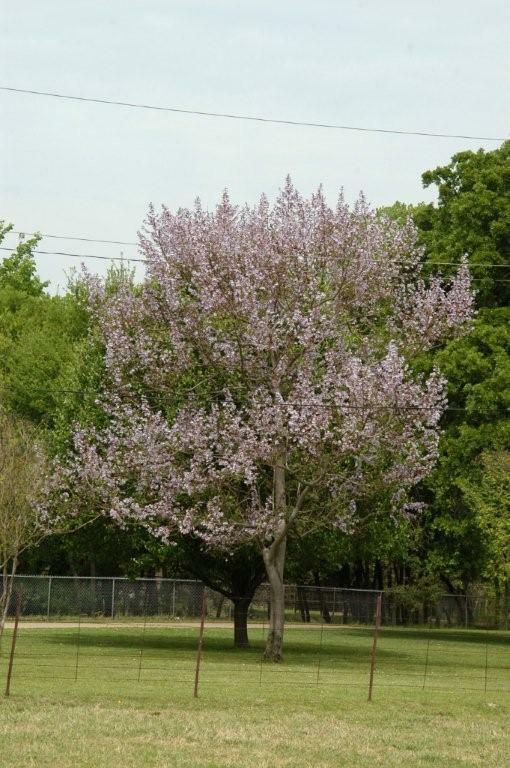 Royal Paulownia (Empress Tree) -- with good root flare. Leaves are simple, opposite and deciduous, occasionally whorled on vigorous sprouts, heart-shaped, and wooly hairy below. Flowers are are large, purple, trumpet-like in large, terminal clusters. Fruit is a "nut-like" capsule. 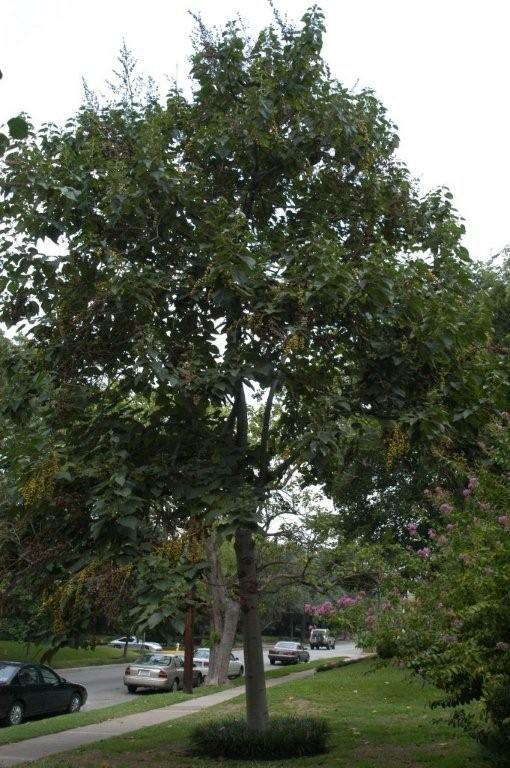 The Empress tree is originally from China but has naturalized in open, disturbed areas in the eastern U.S. In Asia, the wood is used for cabinets and furniture. Twigs are stout and gray-brown with notched leaf scars. Bark is gray and smooth, becoming shallowly furrowed with age.